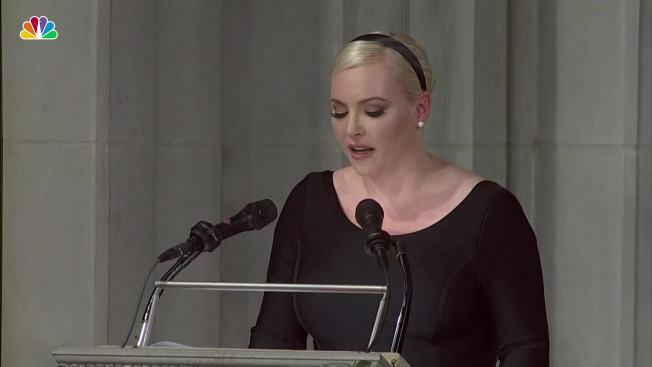 Taking a direct jab at Trump's campaign motto, she said to applause, "The America of John McCain has no need to be made great again because America was always great." Trump was not on hand for the ceremony, after McCain's family made clear he was not invited. 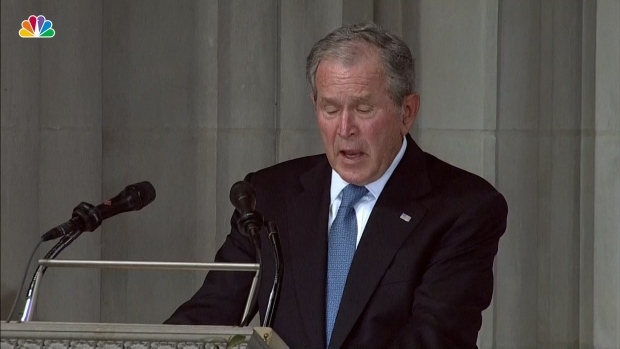 At McCain's request, Obama, a Democrat, and Bush a Republican spoke at the service, to highlight the bridge-building that he espoused. 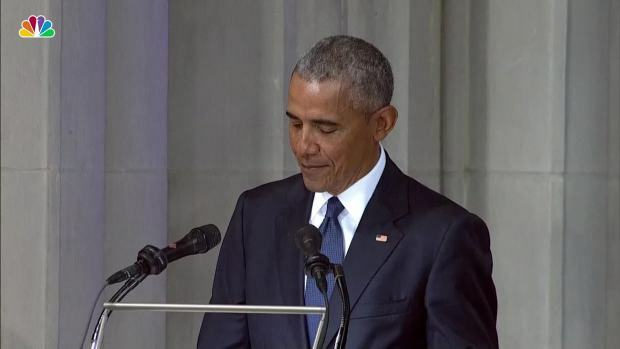 The two former presidents drew on the senator's legacy at home and abroad to talk of the nation's values in remarks that at times seemed a clear rebuke of Trump and his brand of politics. 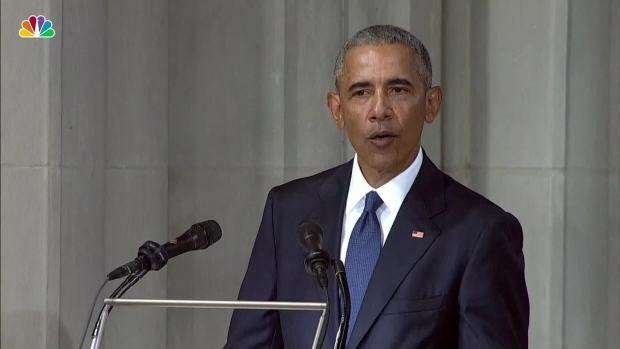 Obama, who also challenged McCain in his bid for the White House, spoke of McCain as understanding that America's security and influence came not from "our ability to bend others to our will" but universal values of rule of law and human rights. McCain was a decorated veteran who was held for more than five years as a prisoner of war in Vietnam. He refused early release. President Trump obtained deferments for his college education and a foot ailment. McCain has long urged the Senate and the polarized nation to recognize the humanity even in bitter political opponents. 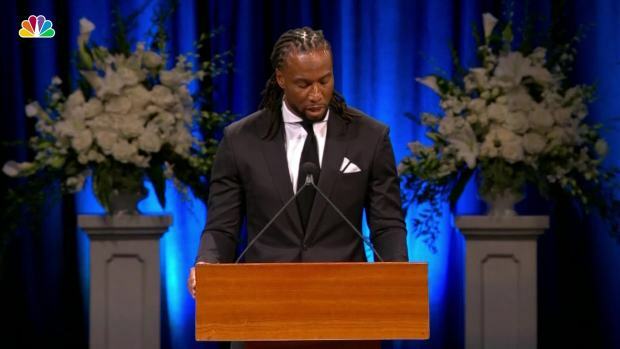 McCain's request for speeches by the former presidents, to some, represents that ideal. 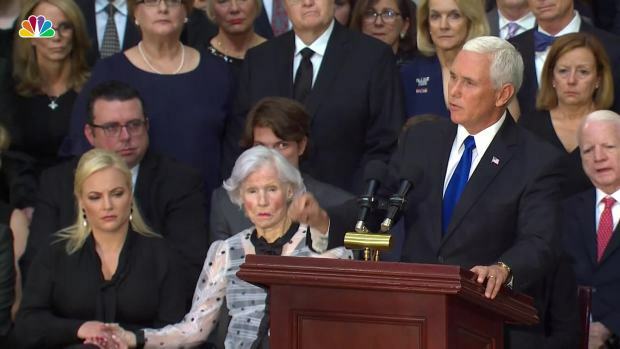 Vice President Mike Pence remembers a trip he took abroad with Sen. John McCain, where the senator let Pence off the hook for falling asleep.